Apart from Jesus the primary character is Simon who will later get his name changed by Jesus to Peter. Simon lives by the Sea of Galilee and makes his living as a fisherman. 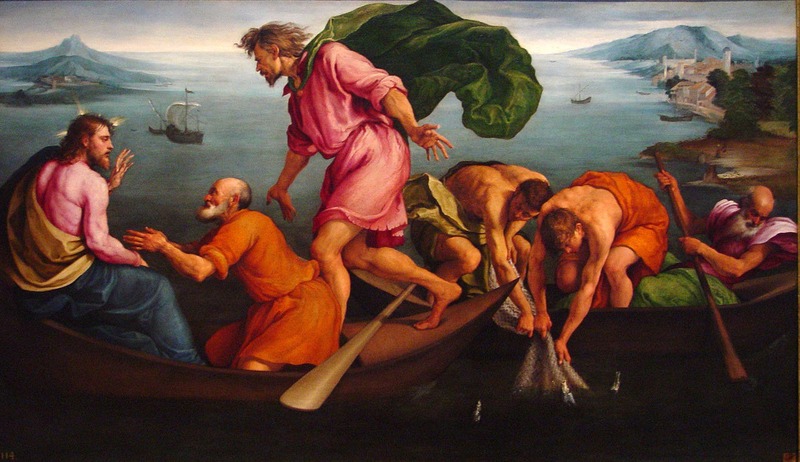 He has a boat and a net and there are other fishermen who work with him, most notably the brothers James and John. The best time to catch fish is at night so that’s when they go out in the boats and let down their nets. It must have been so dark some nights that they couldn’t see a thing but they’ve done this so many times it doesn’t really matter. But even though they have no fish to show for their efforts and they are exhausted and just want to go home to get some rest, each morning the job is not complete until they have done the boring job of cleaning their nets because the nets are the essential tool of their trade and if they don’t clean them the nets will quickly deteriorate and become useless. Another thing our story tells us about being a human is that because of all that has to be gotten done we often feel fatigued – utterly exhausted — and sometimes this fatigue leaves us irritable which is the impression you get with Simon’s initial response to Jesus’ directive to put his boat out yet again into the deep waters and lower his nets once more. Along with irritation you get the impression that life for Simon often included feelings of despair and hopelessness – the thought that in spite of how hard we work we aren’t getting ahead, we’re not making progress – that in fact we’re actually losing ground. We can assume that in his life Peter had done some so-called “bad” things in his life along the lines of getting irritable and losing his temper and saying things he regretted. This sense of separation is tied to the unavoidable gravitational pull of self-centeredness that is a part of all of our lives, this state in which we ourselves are routinely the central reference point by which we gauge everything. But sometimes on the inside the feelings and thoughts that overtake us seem like a stinking cesspool of pettiness, lust, fear, greed, anger, self-absorption, self-pity, despair and of all sorts of judgments rendered – of others but also of ourselves. And there is this thought that arises sometimes: if people really knew me – really knew the cesspool of thoughts and feelings that race through my head – they could never love me. Sometimes with our preconceptions we miss exactly what takes place. With Simon having declared himself a sinner, you might expect Jesus to say, “Your sins are forgiven,” but he doesn’t do that because the sin we’re talking about here isn’t really about particular bad things Simon has done; it is about the great chasm that Simon feels separating himself from God. As the story progresses we will see that there will be a transformation that takes place in Simon but it will take place slowly over time, with many stumblings along the way. These various dark feelings I’ve described as part of being a human being – they didn’t automatically cease to be a part of Simon’s experience when he became a follower of Jesus. Simon’s worst inner cesspool experience is still to come – the infamous night of Jesus’ arrest. “Listen folks, I know what life feels like for you sometimes. I’ve been there. Sometimes I still go there. But I am here to tell you about a love that has been revealed in this man Jesus that is healing those gaps in my soul. Next PostNext Lent is Coming!